Bookride: Ayn Rand. Atlas Shrugged. Ayn Rand. ATLAS SHRUGGED. Random House, NY 1957. 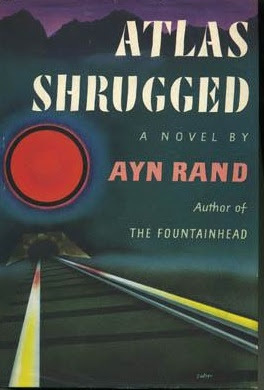 Ayn Rand had original wanted to call it 'On Strike' but her husband came up with 'Atlas Shrugged', a brilliant title. Not absolutely sure what it means. Has sold over 6 million copies and changed lives. Novel of ideas. Very pro capitalism. Often voted greatest novel of the 20th Century in USA, occasionally it's 'The Hobbit' and sometimes 'Ulysses.' Book opens 'Who is John Galt?" and it takes 650 pages before the reader gets the glimmer of an answer. The phrase has entered the language as an expression of puzzlement, apprehension or mock despair. Not quite as memorable as 'Call me Ishmael' but a darn good opening line. 2008 is said to the date of the release of the movie. 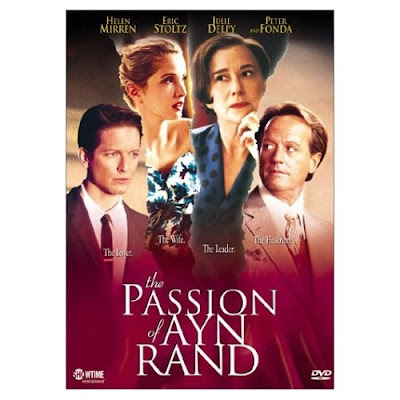 A film 'The Passion of Ayn Rand' starring Helen Mirren gives a slightly chilling portrait of her. Peter Fonda plays her long suffering spouse. VALUE? A very decent first wearing jacket can be had for less than $1800. Faultless copies can be found at about twice this although oddly a copy described as '...Very fine copy in a fine plus first issue jacket...' is not faultless but rubbed at corners. I guess 'very fine' is better than 'fine plus' but both are a few degrees short of very fine plus. This sort of grading is a little dubious but you tend to see it around Rand and also SF highspots. Her prices are not going down, despite the Rush / Rush endorsement, if anthing they are keeping pace with inflation.